Don't forget about low tech advertising and marketing... Doorhangers can be very cost effective. 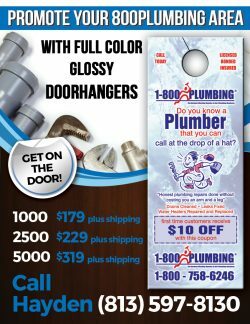 1-800-Plumbing > Blog > Plumbing Advertising > Don’t forget about low tech advertising and marketing… Doorhangers can be very cost effective. When I think about the changes since I have been licensing 1-800-PLUMBING I remember 15 years ago when internet marketing was still quite young. The yellow pages was still the “only game in town” and everyone wanted to be the first ad, largest ad, front page, back page, etc…. The yellow pages kept going up and price and then came internet marketing. Google Adwords, PPC, Organic SEARCH. As the yellow pages plummeted and internet marketing became the new “King of the Jungle” one thing remained constant and that is search. There are still so many other effective advertising methods and I wanted to remind you of one that I believe could be the most cost effective of them all. Doorhangers! When you go out to a job, how easy is it to drop 6 – 10 doorhangers in the neighborhood. If you multiply this over days, weeks, and years, it really is an effective way to reach a lot of prospective customers. Doorhangers are inexpensive to print and when used consistently over time, they can be very effective! I think it is very important to have a strong web presence. I also believe that in some cases PPC (Google Adwords) has gotten out of control and companies are bidding way too much for the best keywords. With a little creativity it is possible to have an effective campaign with effective SEO and other off line strategies. Every company is trying to differentiate themselves from the competitors and in a crowded market that can sometimes be a daunting task. 1-800-PLUMBING is a unique and powerful strategy that sets a company way above the competition through a local branding strategy that is highly effective. I will only recommend vendors that I have been working with and have a great track record. I have been using Hadyn’s Doorhangers Etc for more years than I can imagine. For great service and a product that is second to none, this is where you need to go!